The round goby is a small, bottom-dwelling invasive fish. Native to the Black and Caspian seas in eastern Europe, it was first found in North America in 1990 in the St. Clair River north of Windsor, Ontario. Researchers believe the fish was brought to North America in the ballast water of ships from Europe. In less than a decade the round goby has successfully spread through all five Great Lakes and has begun to invade inland waters. In some areas the fish has reached densities of more than 100 fish per square metre. Round goby prefer waters with rocky and sandy bottoms. They feed aggressively on insects and other small organisms found on lake and river bottoms. Adult round goby eat large quantities of zebra and quagga mussels, and occasionally small fish and fish eggs. Their aggressive eating habits and ability to spawn several times each season have helped them multiply and spread quickly. 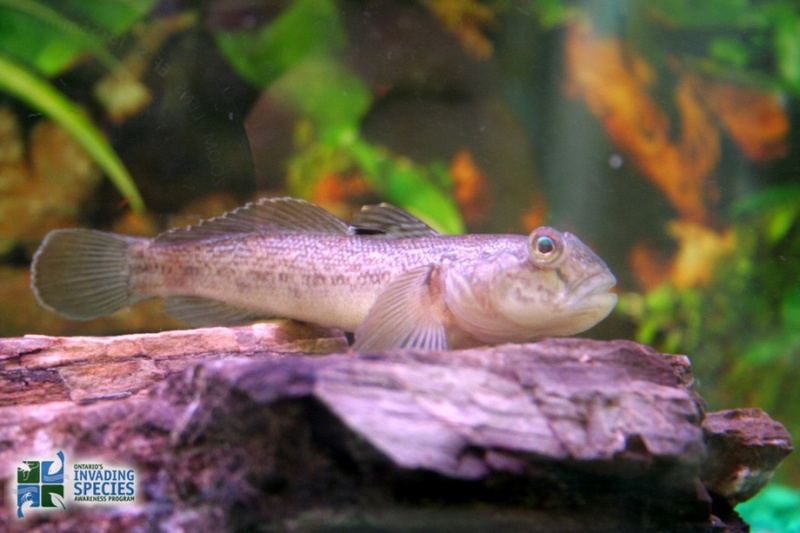 Outside its native range, the round goby has been found in all five Great Lakes and many of their tributaries, including the Illinois River. Round goby are also found in some inland waters in southern Ontario such as Lake Simcoe, the Trent River, Rice Lake, and parts of the Otonabee River. 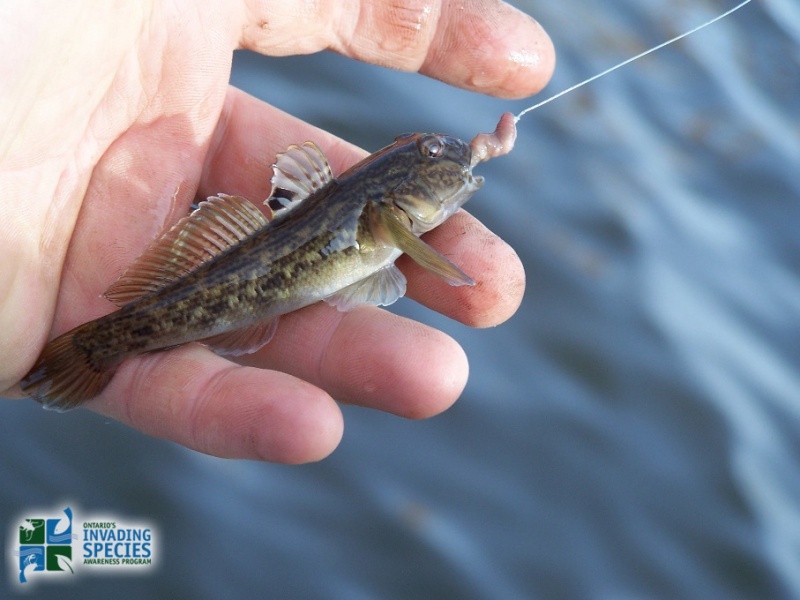 Click here for the Early Detection & Distribution Mapping System (EDDMapS) to view and contribute to Round Goby sightings in Ontario. The round goby's aggressive habits and rapid spread have had serious impacts on native species. 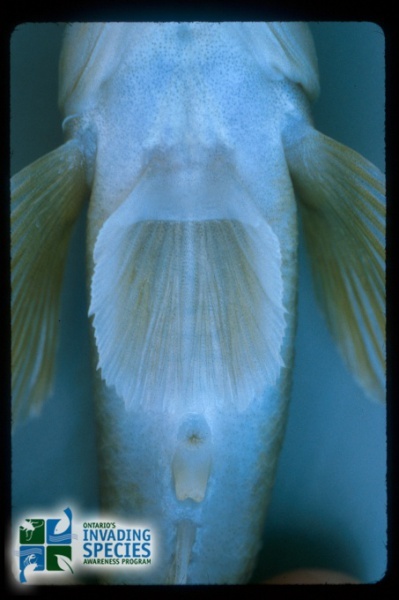 The fish compete with and prey on native bottom-dwelling fish such as mottled sculpin (Cottus bairdii) and logperch (Percina caprodes). 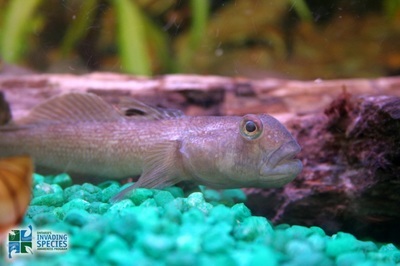 Round goby also threaten several species at risk in the Great Lakes Basin, including the northern madtom (Noturus stigmosus), the eastern sand darter (Ammocrypta pellucida), and several species of freshwater mussels. Round goby have reduced populations of sport fish by eating their eggs and young and competing for food sources. Researchers believe the round goby is linked to outbreaks of botulism type E in Great Lakes fish and fish-eating birds. The disease is caused by a toxin that may be passed from zebra mussels, to goby, to birds, resulting in large die-offs of fish and birds. 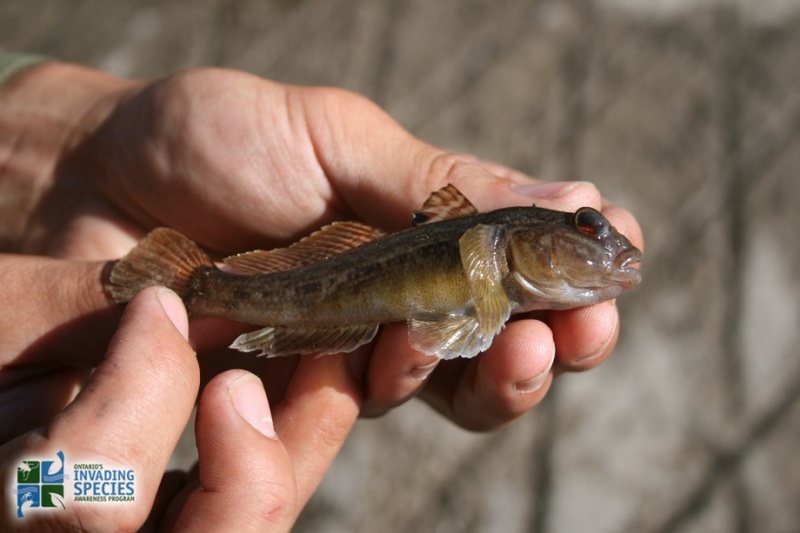 To prevent the spread of this invasive species, the Ontario government has banned the possession of live round goby and the use of round goby as a baitfish. Adult round goby are six to 16 centimetres long with a cylindrical body and a rounded to blunt snout. 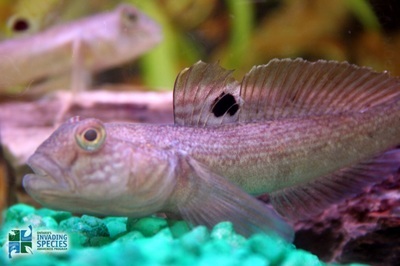 The round goby looks similar to several species of fish found in the Great Lakes, including the invasive tubenose goby and native sculpins (Myoxocephalus thompsoni and Cottus sp.). Learn how to identify round goby and how to prevent the spread of this unwanted species. Never buy or use round goby as bait. It is against the law to use round goby as bait or to have a live round goby in your possession. Don’t put any live fish into Ontario lakes, rivers or streams. If you have any information about the illegal importing, distribution or sale of round goby, report it immediately to the MNR TIPS line at 1-877-TIPS-MNR (847-7667) toll-free any time, or contact your local MNR office during regular business hours. You can also call Crime Stoppers anonymously at 1-800-222-TIPS (8477). If you’ve seen a round goby or other invasive species in the wild, please contact the toll-free Invading Species Hotline at 1-800-563-7711, or report a sighting online. OFAH/OMNR Invading Species Awareness Program. (2012). Round Goby. Retrieved from:http://www.invadingspecies.com. This factsheet may be reproduced for non-commercial purposes.